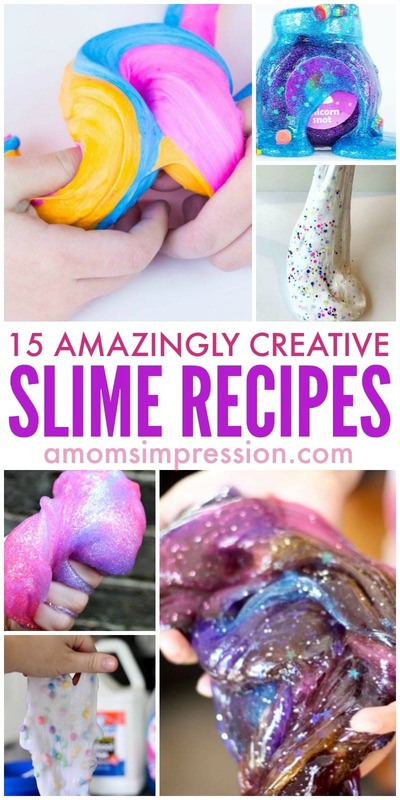 Check out these 15 fun slime recipes that kids are going to love! The kids won’t be saying they are bored anymore without anything to do. Making slime is a fun kid activity that can be done year round. This collection includes Borax free recipes and even slime made from soap. It is all the rage right now with the kids, slime is being made, sold, and played with on a daily basis. I love seeing all the young entrepreneurs out there selling their slime to their friends. If you are not familiar with slime, it is really easy to make and a lot of fun to play with. The basic slime recipe is to add equal parts glue and water to a bowl and stir together. Next, you add your food coloring and anything else you want like glitter. Finally, add an equal part of a saline solution or liquid starch and stir until combined. We prefer not to use Borax in our slime recipes but there are recipes that will use Borax instead of liquid starch or saline solution. For a fun and clean slime, recipe be sure to check out our dish soap slime. If you think outside the box, you can make some pretty incredible slime recipes. Here are some creative slime recipes that I think you will enjoy! For more fun with your kids be sure to check out our fun spring activities for kids!